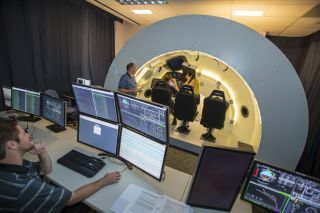 Engineers and managers work inside a simulator of The Boeing Company's CST-100 spacecraft during evaluations of potential designs and software functions in a room at the company's Houston location. Four private companies working to build commercial spaceships to launch NASA astronauts into space are gearing up for a big year in 2014, space agency officials say. This year, private spaceflight companies Blue Origin, Sierra Nevada Corp., Boeing Space Exploration and SpaceX — which are all NASA partners the space agency's commercial crew program — will continue to perform tests and reviews for their respective space systems. "Our partners have steadily moved pieces from the drawing boards and computer screens to factory floors and test stands across the country," said Kathy Lueders, acting manager of the commercial crew program said in a statement. "The new year offers exciting opportunities for these companies to demonstrate the reach and potential of their hard-earned innovations." Boeing completed a design review in 2013 and continued developing its spacecraft called the CST-100, NASA officials said. The review allowed officials to confirm that the service module propulsion system is ready to move into production and integration with the company's spacecraft, according to NASA. "Boeing's goal is to develop a safe and reliable commercial space transportation system and these reviews are vital to meet that goal," Gennaro Caliendo, NASA's integration team lead for Boeing, said in a statement. "They help ensure that the spacecraft and its myriad systems will work together to accomplish challenging missions, which require the utmost attention to detail." An Erickson Air-Crane helicopter lifts Sierra Nevada Corporation's Dream Chaser flight vehicle during a captive-carry flight test. The test was a rehearsal for future free flight tests. Sierra Nevada Corp.'s Dream Chaser space plane is a reusable spaceflight vehicle that bears some resemblance to NASA's space shuttles, which were retired in 2011. In 2013, the company performed its first free flight of the space plane, hoisting it by helicopter above Edwards Air Force Base in October. After the helicopter released the unmanned vehicle, Dream Chaser glided down to the tarmac, however, due to a landing gear malfunction, the spacecraft skidded off the runway at the end of the otherwise successful flight. Blue Origin — the secretive spaceflight company owned by billionaire Amazon.com CEO Jeff Bezos — test-fired its BE-3 engine last year, and officials with the company are planning on reviewing the space vehicles subsystems design in 2014, NASA officials said. The rocket engine test was designed to simulate a mission using the company's suborbital New Shepard space vehicle. The engine fired for 2.5 minutes and produced 110,000 pounds of thrust. The BE-3 engine then stopped for four minutes before firing again, simulating a coast through space and a short final burn. The engine will also be used in the company's planned Orbital Launch Vehicle, which is designed to launch the Space Vehicle into orbit. Sierra Nevada officials are expected to perform the second free flight for Dream Chaser in 2014. The Dragon test article is displayed at SpaceX Headquarters. It will be used for upcoming testing. SpaceX — founded by billionaire entrepreneur Elon Musk — is expected to use its upgraded Falcon 9 rocket, which launched its first commercial satellite into orbit in September, to eventually bring humans into low-Earth orbit. NASA engineers were able to review the performance of SpaceX's rocket during its flight from Vandenberg Air Force Base in California. "With the upgrade from version 1.0 to a 1.1 [Falcon 9], SpaceX introduced a number of new systems including new engines, new software and new avionics," Derek Hassmann, NASA partner integration manager working with SpaceX, said in a statement. "The overall conclusion is that SpaceX is on the right track. The goal really isn't to judge their design, but to see how they cope with anomalies, see how they track their processes and control their hazards and how they're able to deal with the unexpected." In 2014, SpaceX is expected to perform two flights to test its Dragon capsule's launch abort systems. The Dragon capsule is a manned version of SpaceX's cargo-hauling capsule currently used to make robotic resupply trips to the International Space Station.